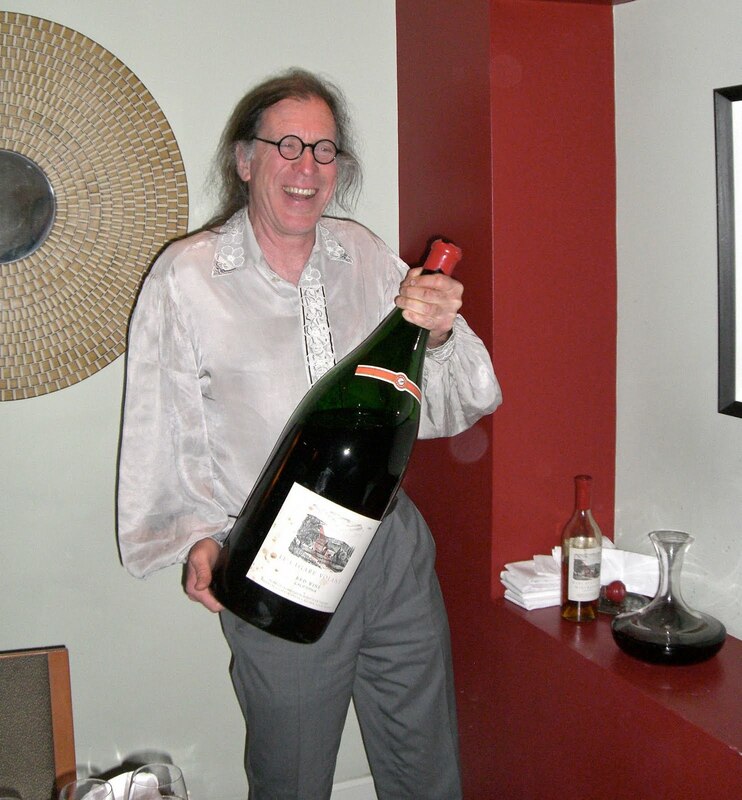 Randall Grahm is always interesting, sometimes at the expense of his wines. At the dinner, Grahm told us about an interesting new vineyard project, which I have a story about today on Palate Press. This, though, is about the wines. This was unlike most vertical tastings, where you get a sense of a vineyard because the wines all come from the same place. Grahm has used, by my count, 31 different vineyards from 11 different counties in Le Cigare Volant -- the wine he calls Bonny Doon's "spiritual center." Not one vineyard provided grapes to every vintage, though Besson Vineyard in Gilroy -- a town better known for garlic -- came close, as a source of Grenache from 1984 to 2006. Then there are grape choices. Grenache, Mourvedre and Syrah have been the main grapes, but he has also used five others, although 3 appeared in only one vintage each. And while GSM are often blended together in both France and Australia, they are three very different grapes: Grenache delivers bright fruit, Mourvedre is earthy and funky, Syrah tends toward bold masculine flavors. As the ratio changes between them, you could taste the different characters in ascendancy. What I learned was an evolution not of a vineyard, but of Grahm and Bonny Doon. Like a rock and roll band, Grahm was brilliant right out of the gate before he really knew what he was doing. Then he learned the industry and got a little business-cynical, and it showed up in lower quality wines. Eventually he listened to his inner voice and brought the quality back up again, but he has yet to recapture, let alone surpass, the greatness of the first two wines. Johnny Cash eventually did, so there's hope for Grahm yet. Here's a rundown of the wines. The first vintage of Le Cigare Volant was the best wine of the night, and I'm glad because Grahm said the 6-litre bottle he brought was the last bottle of any size that he had. Grahm started making Le Cigare Volant based on the old-vine Grenache from Gilroy. In 1982, Grahm had leased space from Josh Jensen at Calera to ferment some Grenache. "It smelled like raspberries. I thought, 'This is good'," he said. "I ended up blending Cabernet to it and screwing it up." It wouldn't be the last time. Had Grahm maintained Le Cigare Volant as a 1200-case Grenache-based wine, it might today be considered one of America's greatest. You'll see from the stats that he started tinkering with a successful formula within just two years. Grahm said '84 was a difficult vintage, and the Grenache didn't ripen as much as he wanted. Perhaps that's why it aged so well. Grahm discovered Contra Costa County Mourvedre for this vintage (the '84 Mourvedre was from San Martin), and it has played a role in every vintage since. It gives the wine a much rougher, earthier character than the pretty 1984, but that's not necessarily a bad thing. We drank this out of a 750 ml bottle and it was oxidized. Done and gone. Beginning of the dark ages. Note the not coincidental jump in percentage of Syrah -- a grape better suited for New World type wines. "Part of that was greed on my part in making more Cigare," Grahm said. "But also I switched from large tanks to barrels. I ignored the wisdom of the Old World. Larger tanks keep their freshness better." Grahm apparently got religion about non-interventionist winemaking in 2000, which makes this the most manipulated wine of the whole vertical: he added what he calls "an absolutely lethal dose of organoleptic tannin," and also says it was the year before he got serious about improving his grape sourcing. Finally the Grenache character makes a comeback, probably helped by the discovery of some old-vine Carignane from Contra Costa County. This wine is pretty, with raspberry fruit, violet notes and an elegant mouthfeel. It's a throwback, in a good way. It's interesting because Grahm says the wine stunk during fermentation and he added copper sulfate just before bottling to try to prevent it from stinking in the bottle; it must have worked. If you want to know where Grahm is going with Le Cigare Volant, then try this one, because he loves it: He wrote, "The '05 is just plain wonderful." Thanks very much for your review of this vertical tasting… a virtual travel through time in a bottle. 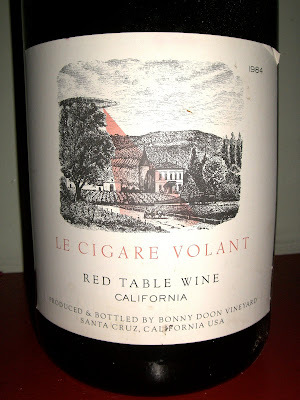 Although I have infrequently enjoyed Bonnie Doon wines over the years we are not heavy California consumers, and so my first experience with Le Cigare Volant was only several weeks ago while having dinner with Randall Grahm. The ’05 was paired with polpettine (the little meatballs made with local lamb, beef, pork, and venison, dried currants, red wine, and bread crumbs ) with sides of contorni and garlic-braised escarole. The course was double paired with the ’06 Nebbiolo, and it was simply delicious. I am sorry to hear your concern that possibly the best of les cigares have left the planet, as I was planning to systematically abduct them in the future. We can only hope that Randall is looking to the future as well, and based on our conversation that evening, he believes that these new versions will also age gracefully. He believes that he has a handle on the reductive process, and that these new vessels with their metallic shielding at the closure will stand that travels through space and time, although they may not fly well in their youth. If anyone is interested we posted the video from that dinner, where Randall is reading from Been Doon So Long, and ruminates on wine and writings.